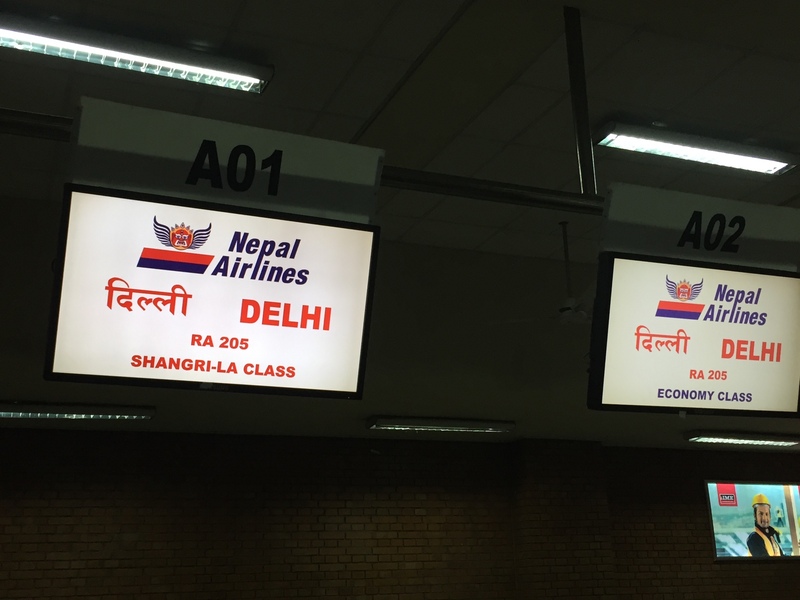 Nepal Airlines Review, Flight from KTM-DEL | No Mas Coach! 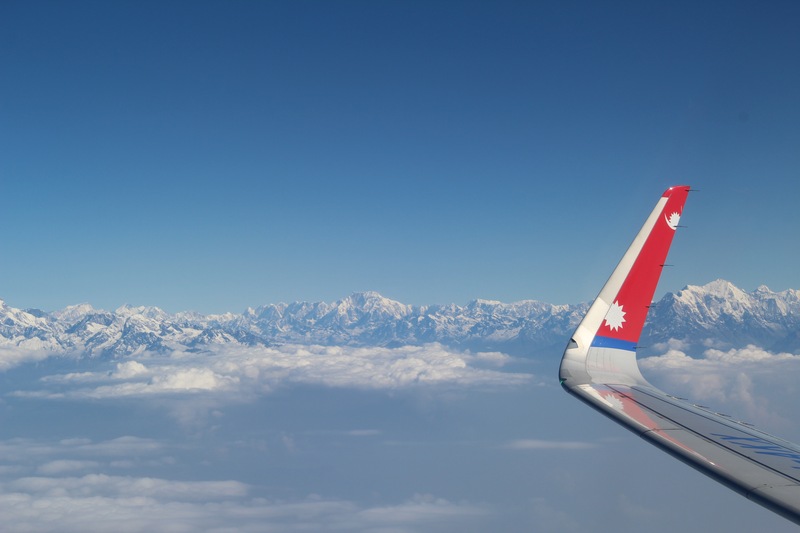 There are three airlines that fly between Kathmandu and Delhi, one of which is Nepal Airlines. 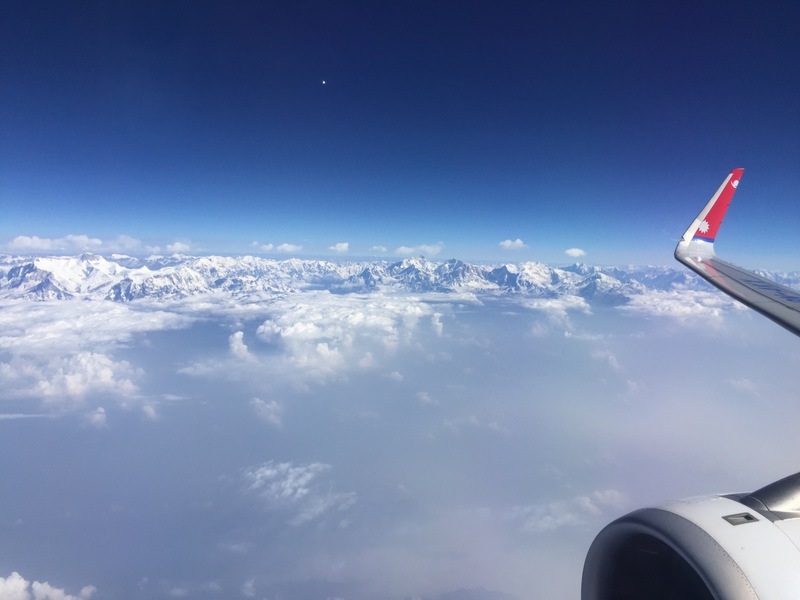 Some other day we could probably find a flight on Jet Airways and Air India, but having the opportunity to fly on Nepal’s flag carrier seemed like an opportunity we didn’t want to miss! 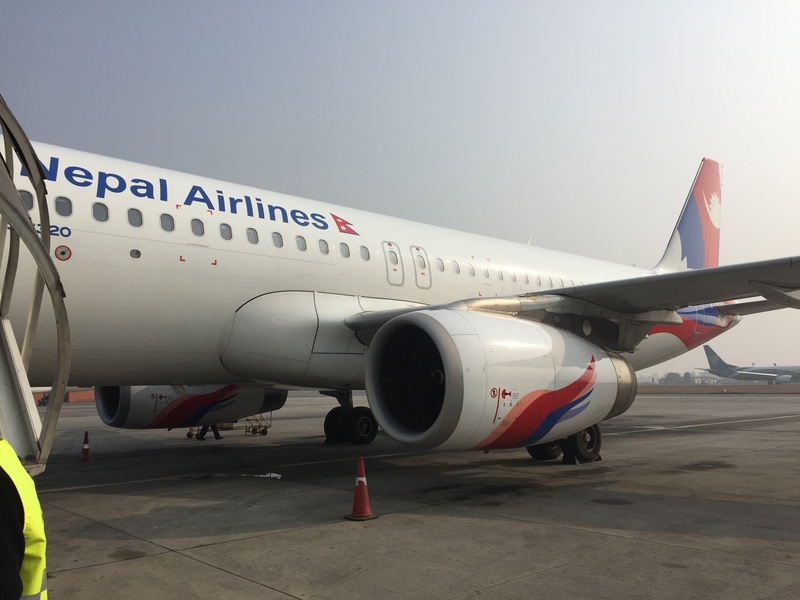 Nepal Airlines only operates with a fleet of 10 aircraft, only two of which are A320’s which they use on international routes between Hong Kong, Delhi, Mumbai, and more. They received their latest plane back in 2014 and are slated to get an A330 in the next year to replace their ailing 757. 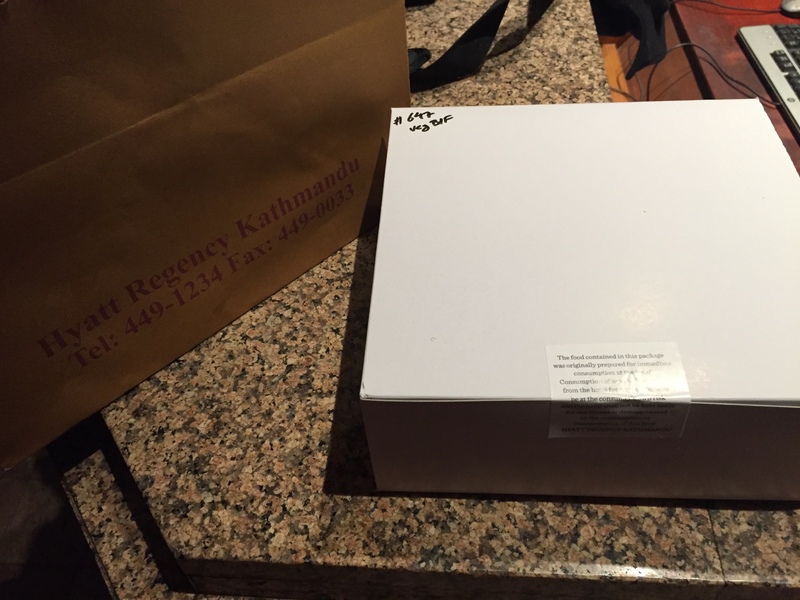 We had to leave the hotel early, so the Hyatt was nice enough to prepack us a breakfast in a box. It wasn’t much, but the muffin, apple, sandwich, and juice were much appreciated considering the early hour of our departure. 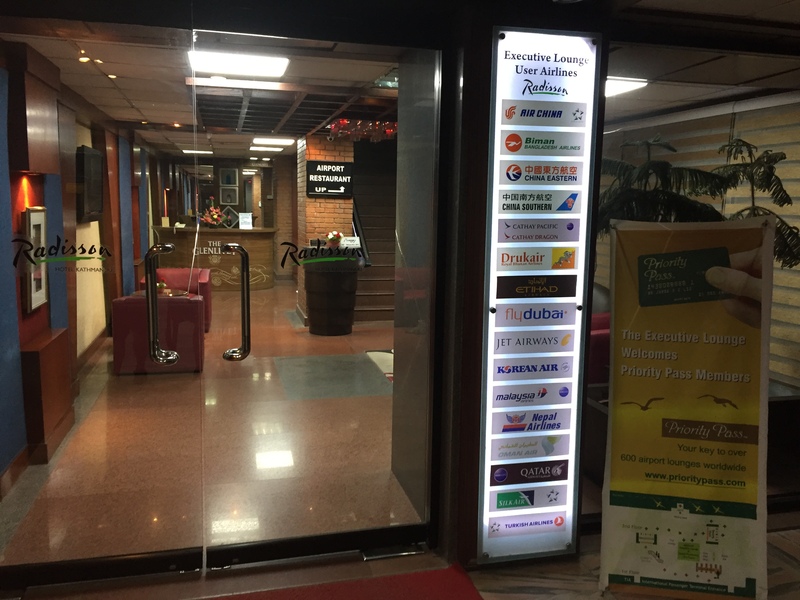 With boarding passes in hand, we went upstairs to the immigration, security, and passport checks. Just to the right of that was the Radisson Executive lounge. Long story short, that one-hour delay turned into a 2 hour and 20 minute delay, but no one would tell us what was going on. They kept saying the “weather” was preventing us from taking off and landing in Delhi, but the Jet Airways flight left perfectly on time. 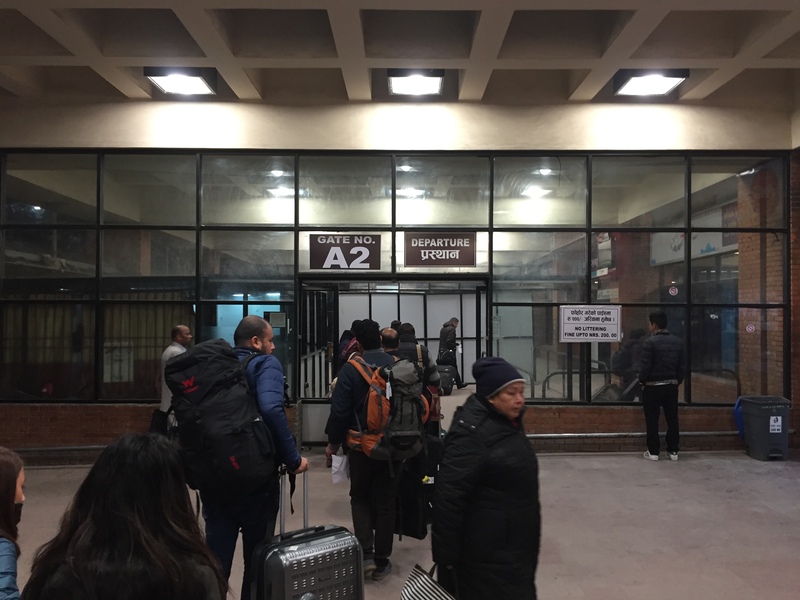 Turns out they wouldn’t leave because per Nepal Airlines, the “fog” was too dense to take off. 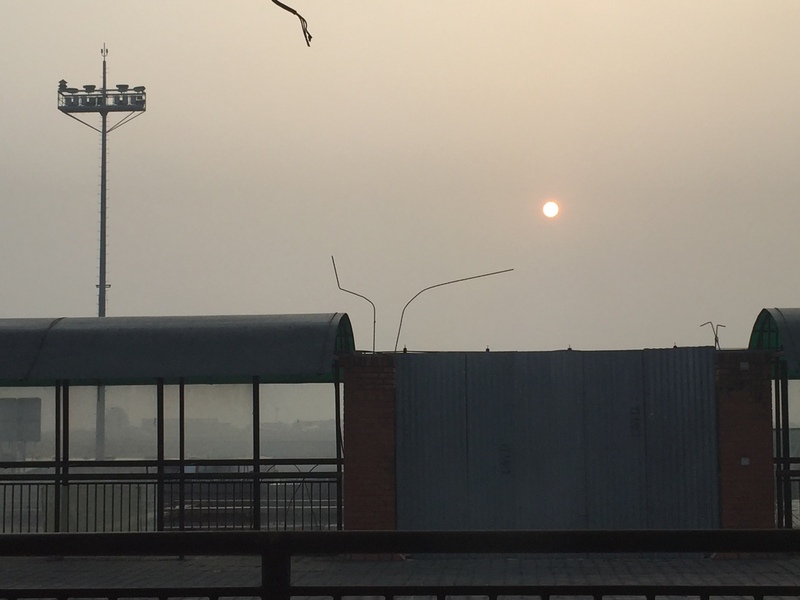 There’s that damn fog pollution again. Just check out the fog! Once boarding was finally announced, we headed towards the gate where we were quickly ushered through the door towards our awaiting plane. 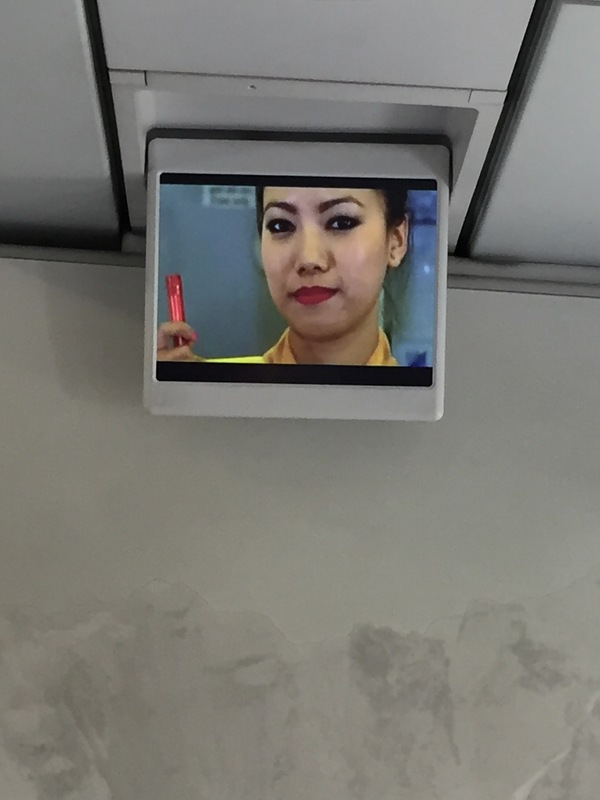 A quick bow at the door and a smile welcomed us onboard and to our seats for the next two hours. 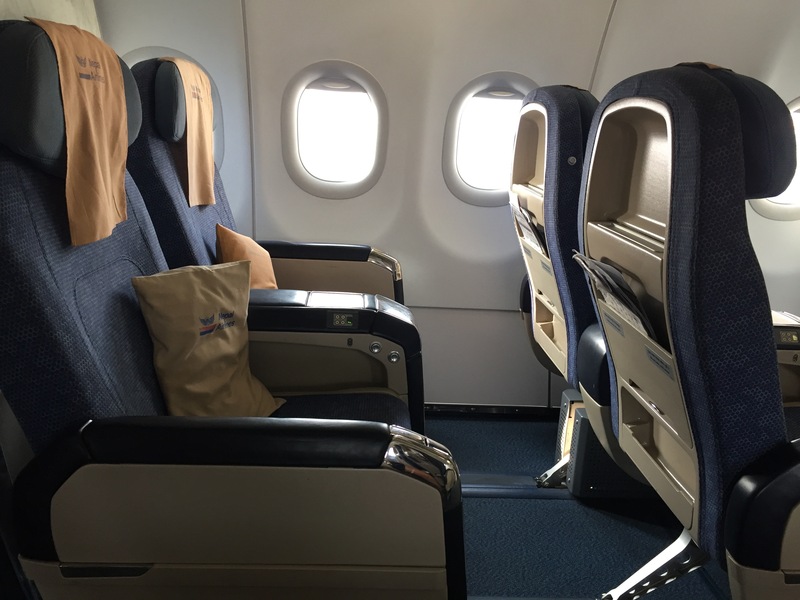 We were the only two passengers on the flight in business class on today’s flight. How do those seats look? Comfy? Think again. 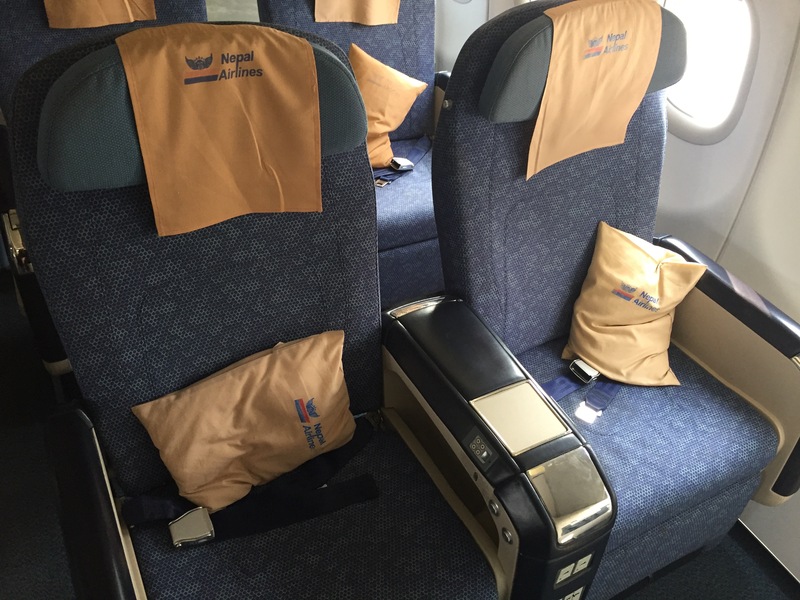 Take a look at those seat backs… they’ve got ZERO cushion and you could tell. You can get a better idea by looking at the seat from the back. 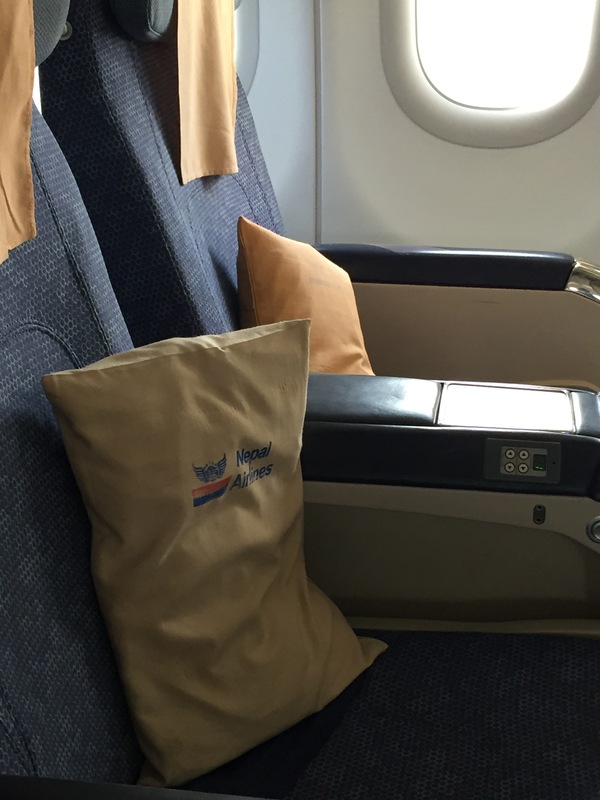 All of the seat is taken up by that hard plastic seat pocket. 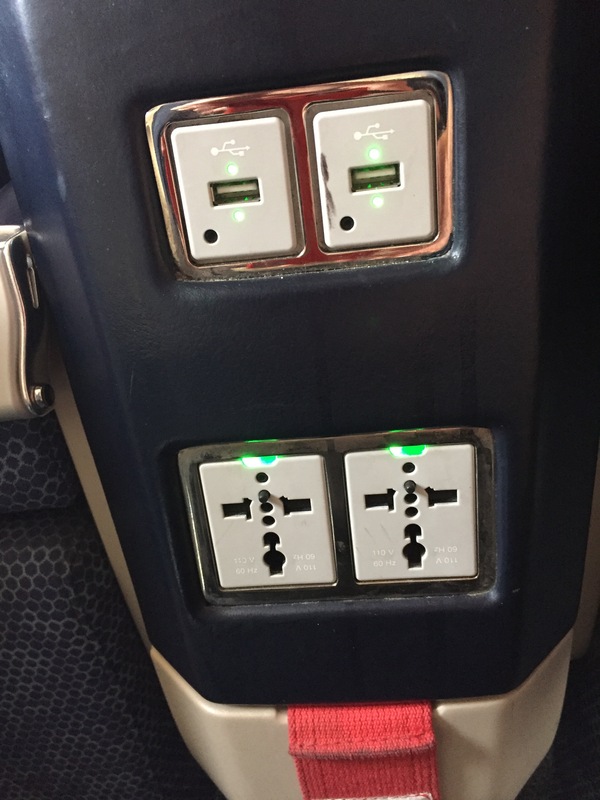 Even though it wasn’t the most comfortable seat, they did have inseat power, including a USB plug! And a comfortable pillow! Even though they were not the same colors. Once seated we were offered some apple juice in a cool branded glass. 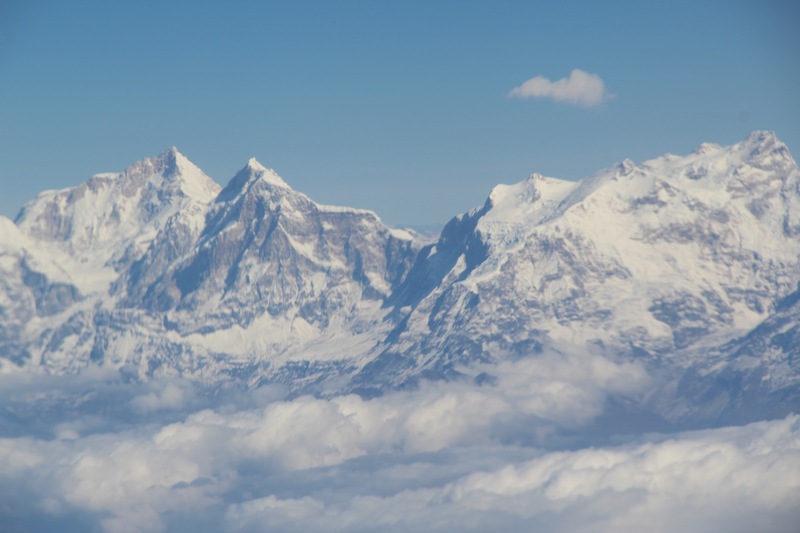 Once we took off our of the “fog” the views were… well… beyond spectacular. Breakfast was served, and apparently they knew the only two people were Westerners, just look at our very Nepalese food. EVERYTHING was branded, from the saltshaker to the napkins. 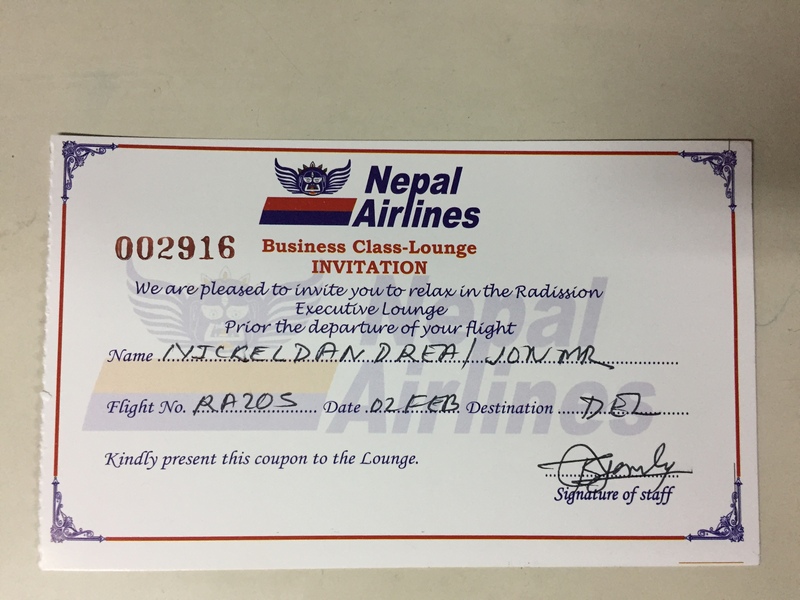 You knew you were flying on Nepal Airlines. 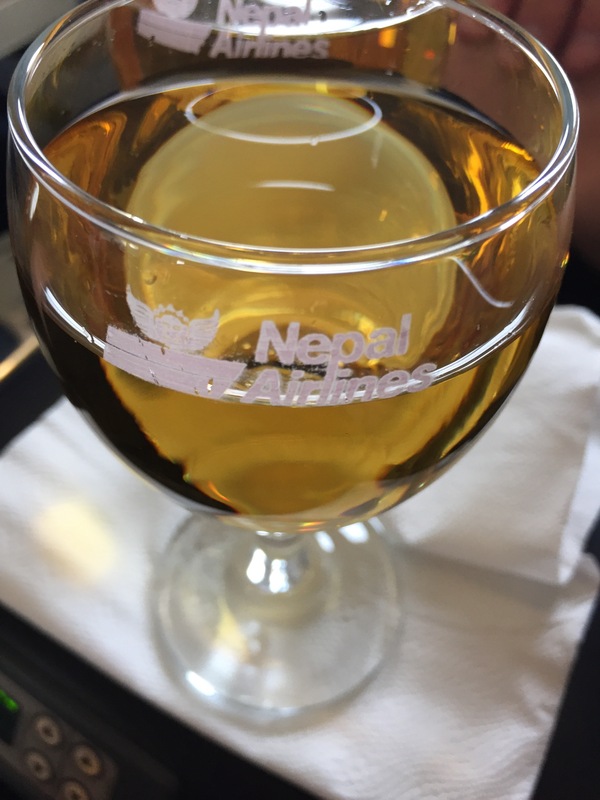 On morning flights, Nepal doesn’t serve alcohol. It was a shame because I was hoping to try some local beer. 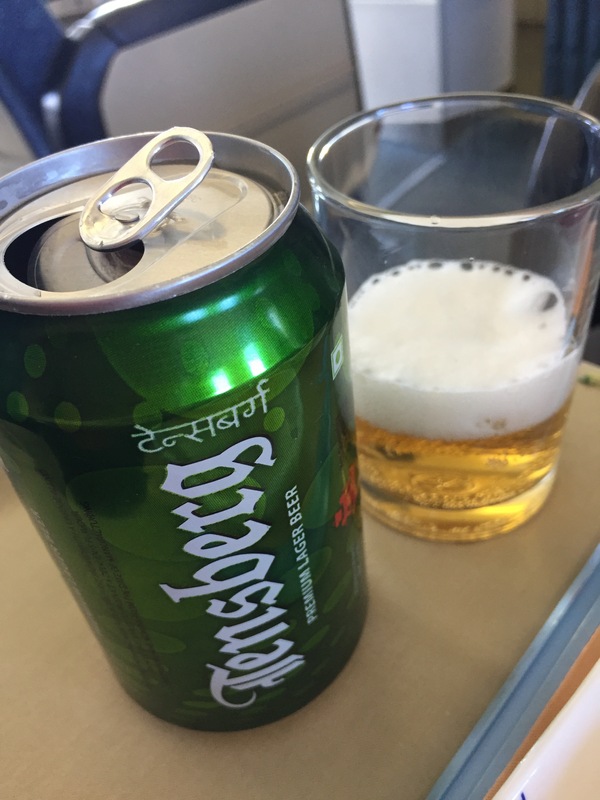 Everywhere that we went in Kathmandu they served Tuborg or Heineken. I didn’t even see a local beer. Luckily, they had the beer stocked but weren’t serving. After I told our FA that I hadn’t had a chance to experience it yet, she made it happen. The things you can get in first class, am I right? 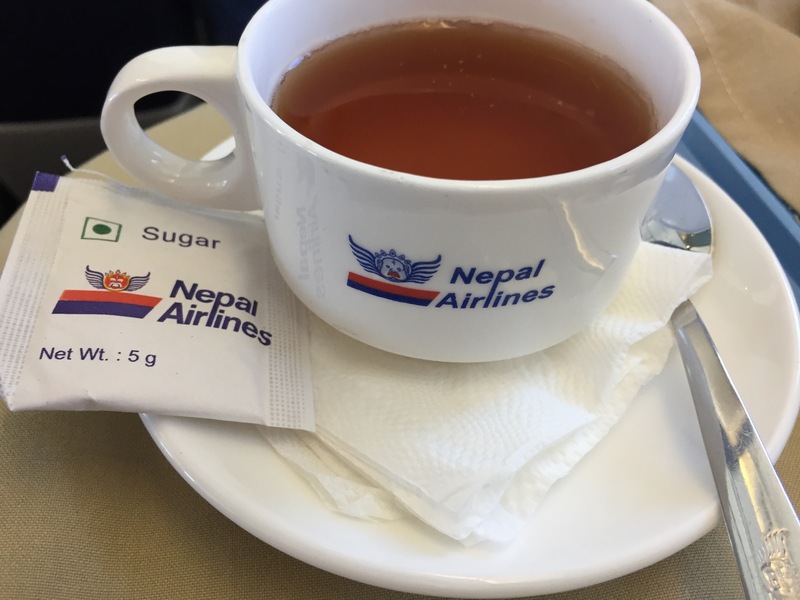 We later asked for some Nepalese tea to finish off the breakfast. 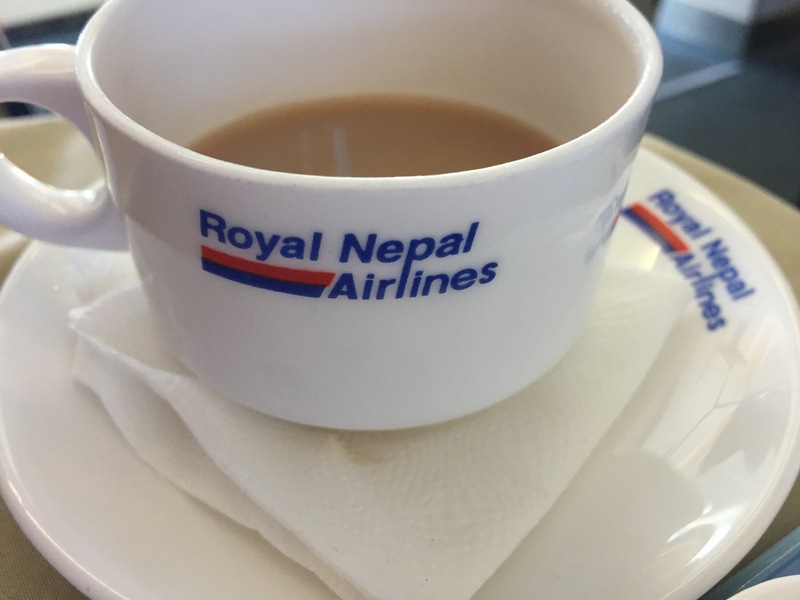 Notice Ben’s cup (Nepal Arlines) and my cup (Royal Nepal Airlines). 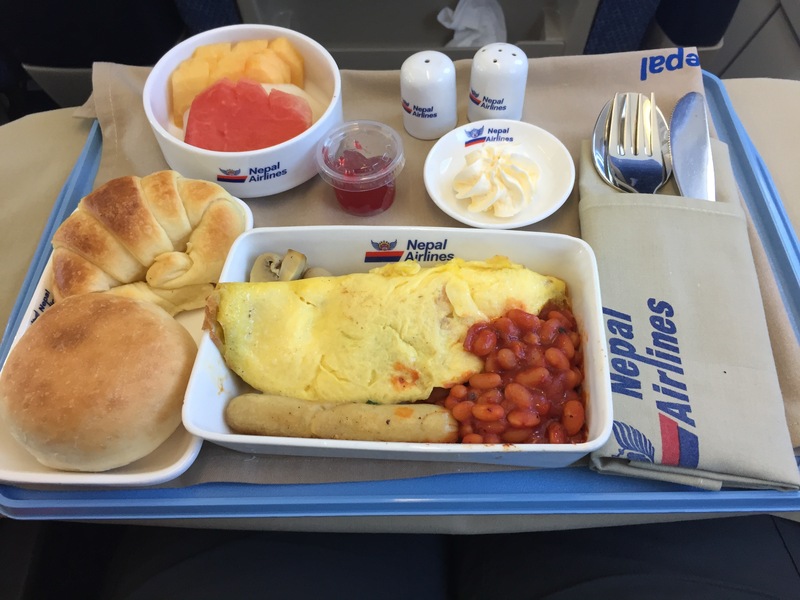 Everything on the tray was branded to Nepal Airlines, but as long as the cups are still good to use, why not recycle? 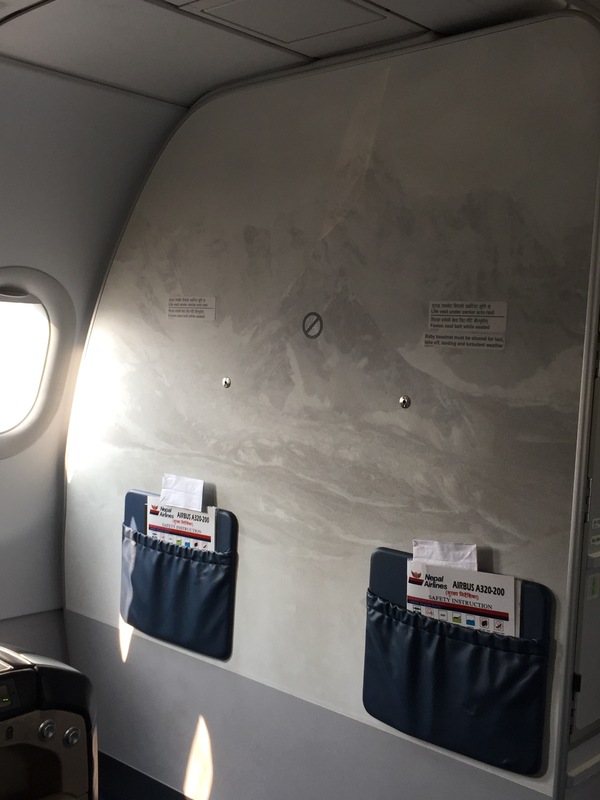 Who needs in flight entertainment when you’ve got great views of the mountains outside. 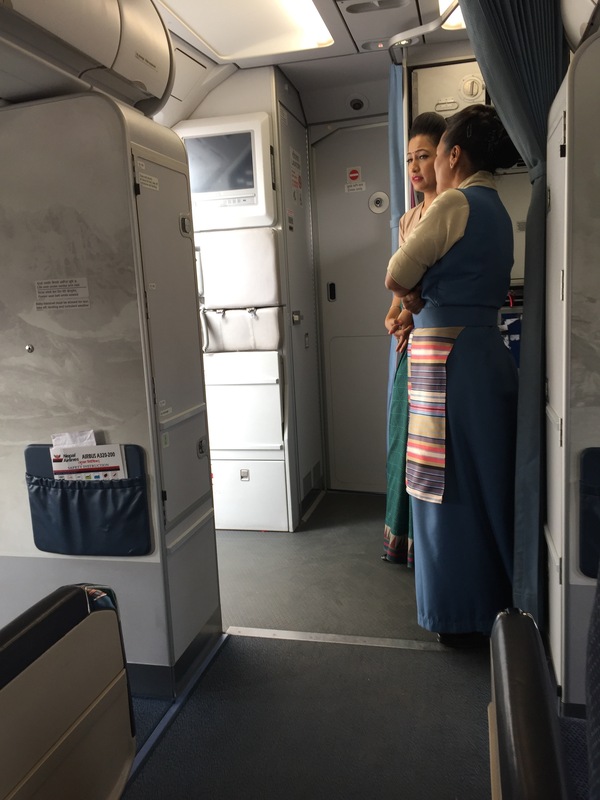 After a nice chat with the two flight attendants, we found out that they only have about 90 or so flight attendants, and they all know each other. Many of them have been around since the beginning and go to each other’s family’s birthday parties, weddings, and funerals. It truly is a family airline. 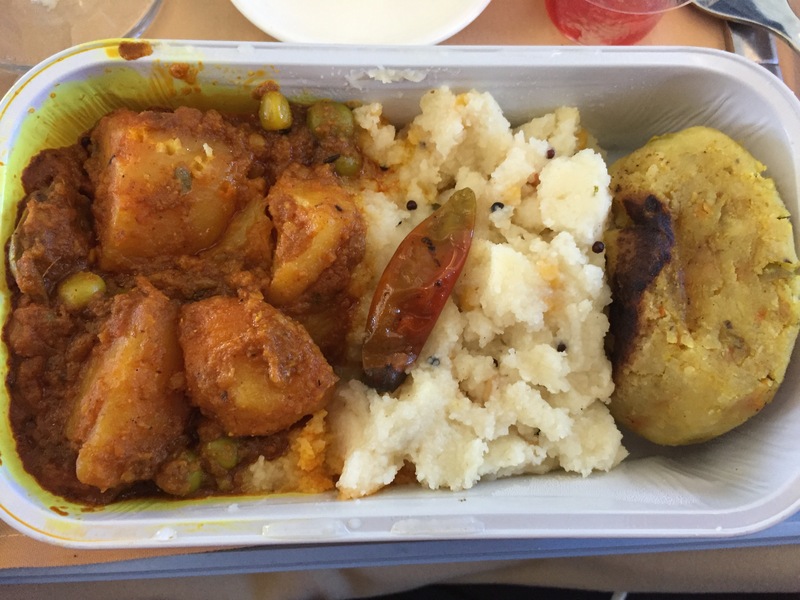 Later, we got to ask why they only offered western meals in first class. She said that if we wanted to try a veg meal (more local ingredients) she would be happy to get us each a meal from coach class. While it was extremely tasty, look at that pepper right in the middle there. Mine was red, while Ben’s was green. Thinking it was a green bean, Ben dug right in and started chomping away. In under three seconds his mouth was on fire and the FA’s were quick to respond with creamer to help tone down the spice. We though we were going to have to make an emergency landing, it was that bad. I’d never seen him that red before! 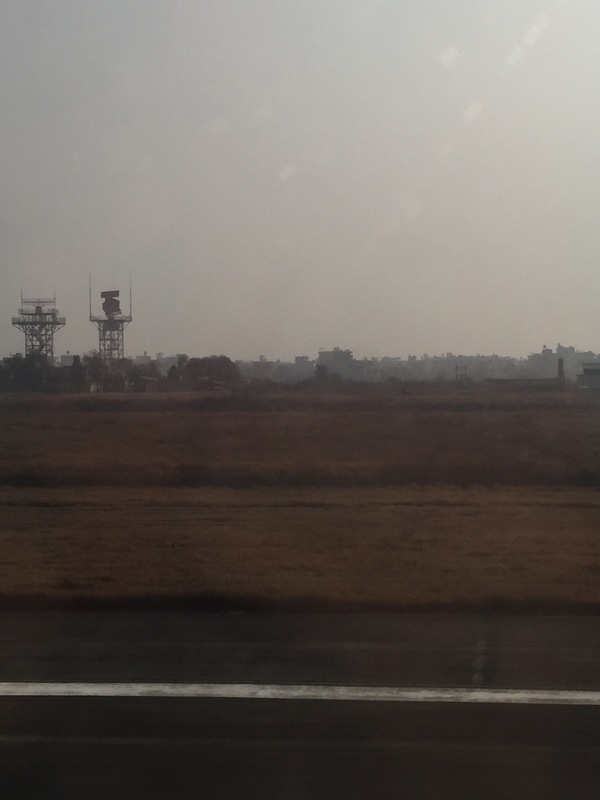 On our decent into Delhi once again you could see the brown “fog” that plagues the city. Literally, if you look at the weather app on your phone, they report it AS FOG! With that said, we had arrived in Delhi and started the long hike to the immigration lines. Honestly, we went into this flight with zero expectations. 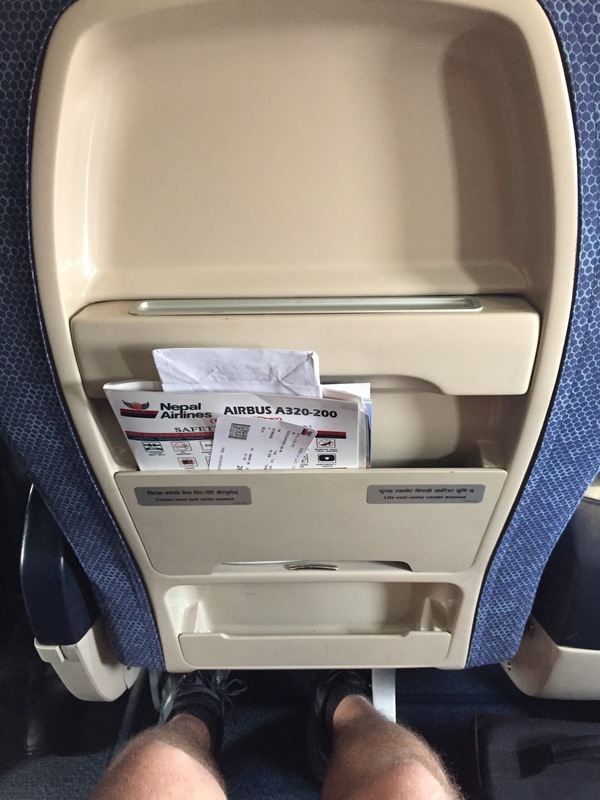 We couldn’t find a review anywhere online, and the only mention of the business class service on the website was something along the lines of “you get a newspaper, food, and a big seat.” We could not have been happier with the flight. Even though it was delayed upon take off, once we got going it was excellent. The flight attendants were beyond exceptional and their service was better than most of the domestic carriers that we’ve flown in the US. I can’t speak to the coach class service, but the back did look pretty crowded and cramped. If you can splurge a little bit extra for the business class experience, I would definitely go for it. It’ll be a once in a lifetime experience you won’t forget!